Properly installing veneer stone is the most important step in creating a long-lasting, believable space. Our installation guidelines walk through the process step-by-step to ensure your stone will last the test of time. Learn how to install manufactured stone with detailed videos and clear instructions. Install stone veneer and brick with ease. Learn the proper techniques for installing Eldorado Stone with this “How to Install” video workshop demonstrating a traditional masonry method. Follow our “Step by Step” instructions and discover how to achieve an authentic stone appearance that is sure to transform your space. Make sure to download the latest installation instructions for complete details. Experience how Eldorado Stone can transform your interior space with this “How to Install” video workshop. Explore the latest recommended installation techniques on how to install manufactured stone; including a detailed “Step by Step” process utilizing a cement board substrate and a polymer-fortified installation system. DOWNLOAD our stone estimation guide to make sure you purchase the right amount for your project. Grout (and sometimes the lack of grout) has an amazing impact on the look and authenticity of stonework. Selecting the desired grout technique and grout color is often as important as selecting the stone. Here we will expore expert stone grout techniques that can be used in a variety of stone projects. Whether you call it thin stone veneer, faux stone veneer or artificial stone veneer, it always benefits from grout. There are three distinct stone grout techniques: Dry- Stack Joints, Standard Joints (Raked) and Overgrout Joints. Dry-stack joint stonework is accomplished by “dry” fitting each stone prior to installation. Each piece can be laid with virtually no joint. Even though you’ve used mortar to set the stone to the surface, when complete, the finished look will appear as though no mortar was used to install the stone. The intent of a dry-stack look is a tightly stacked stone appearance. A standard joint (raked) is achieved by laying each stone roughly one finger width apart from each other, then grouting between each stone. The semi-dry mortar is later “raked” with a variety of tools ultimately achieving a consistent depth and giving it that distinctive raked out look. Overgrout, an increasingly popular way to achieve an old-world look, is sometimes referred to as sack finish. Today, trowels, tuck pointers – even fingers – are used to achieve the overgrouted or sacked look. This technique tends to make the stonework appear rustic and aged. The grout overlaps the face of the stone, widening the joints and making them very irregular. 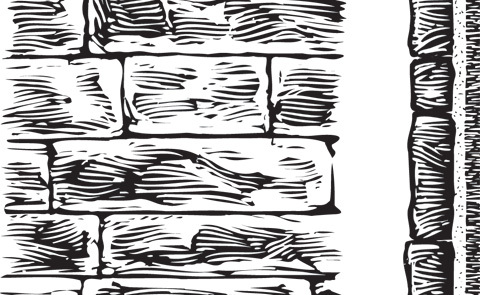 From technical information about our stone and brick veneer products to warranties and maintenance, we’ve got you covered with the resources you need. If you can’t find the information you are looking for, feel free to give us a call! Absorption: 13.3% increase in weight of stone if submerged in water. UL classification shows zero flame spread, zero fuel contributed, and zero smoke developed. Numerous installations in Alaska, Canada, and Northern United States are successful tests in themselves of the durability and freeze/thaw resistance of Eldorado Stone. Eldorado Stone is manufactured from thousands of different molds and each stone is individually colored, so the chances of repetition on any surface are negligible. Eldorado Stone varies in thickness from ¾ inch to 3½ inches, and in size from 8 square inches to 4 square feet, all dependant on stone style. Only permanent mineral oxide colors are used. No detectable color change can be observed even after years of weathering. **Detailed technical data is available upon request. These substrates form the basis for our basic installation instructions. Manufactured stone can be applied to any structurally sound surface. Due to its light weight nature, no special foundations or structural alterations are necessary. On clean (unpainted, untreated and unsealed) brick, block, concrete or other masonry surfaces, install manufactured stone directly to the surface. On all other surfaces, metal lath must be applied first. Outside, on wood surfaces, apply a vapor barrier such as felt building paper before attaching the lath. Although many installations may not require a scratch coat, as a rule all lathed surfaces should be covered with a thin coat of mortar (scratch coat) and allowed to set prior to installing manufactured stone. Stones are applied with mortar in random patterns with uniform joints similar to the setting of real stone. The stones can be cut and trimmed with a hatchet, brick trowel or nippers. The joints are filled with selected grout, then tooled and brushed to simulate real stone applications. The use of a high quality waterproofing sealer such as Craftshield is desirable on any manufactured stone surface, but especially on those exposed to severe freezing and thawing, excessive moisture, or conditions which could discolor or stain the stone. The use of a sealer reduces the absorption percentage from 13.3% down to 4%. No special maintenance is required. If surface soiling occurs, the pressure of water from a garden hose will usually be effective in cleaning the stone veneer. CAUTION: Do not use acid in an attempt to clean the stone. Download the Masonry Veneer Manufacturers Association Install Guidelines HERE. DOWNLOAD the warranty guide for Coronado Stone. 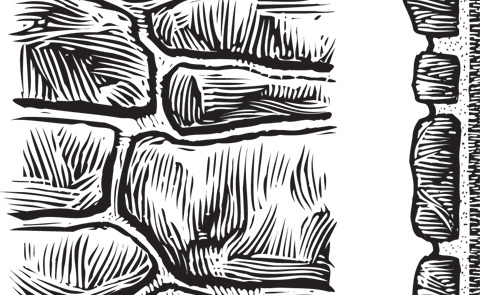 DOWNLOAD the warranty guide for Cultured Stone. DOWNLOAD the warranty guide for Dutch Quality. 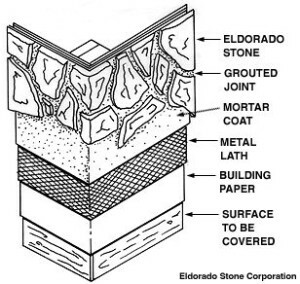 DOWNLOAD the warranty guide for Eldorado Stone. DOWNLOAD the warranty guide for Paragon Stone. DOWNLOAD the warranty guide for Stonecraft Industries. If you’ve got a question, we’ve got an answer! We have compiled a list of our most common questions and answers that we receive from our customers. If you have additional questions, please don’t hesitate to reach out to us. Call us at (618) 282-6722 or email us by clicking here. Q. What is manufactured stone made from? A. Manufactured stone is made from portland cement, lightweight aggregates, and iron oxide colorings. Q. How heavy is manufactured stone? A. Manufactured stone weighs about 10 lbs. per square foot of stone. Q. How thick is a piece of manufactured stone? A. 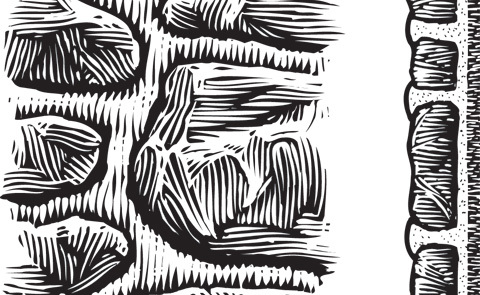 Manufactured stone thickness varies from ¾ in – 3 ½ inches, depending on the style of stone. Q. Is there a warranty on manufactured stone? A. Yes, most of the brands of manufactured stone that we distribute carry a 50 year limited warranty. Q. How are the colors applied to the stone? A. Base color is throughout the entire stone, but accent colors are added into the surface of the stone during the molding process. Q. Will the stone fade over time? A. Manufactured stone has been in use since the late 1960s and no detectable color change can be observed even after years of weathering. Q. Is manufactured stone cheaper than natural stone? A. Yes, installing manufactured stone is 1/3 to 1/2 the cost of installing natural stone. This is because it is light weight and does not require any footings, foundation, or wall ties. This also reduces the installation time and has a 2% waste factor vs. 10% or more for natural stone. Q. What kind of surface do you apply manufactured stone to? A. See our installation procedures in the Technical page. Q. Can manufactured stone be used around swimming pools? A. It can, but we would not warrant it under this type of application. Constant exposure to chlorine and other chemicals will affect the stone’s color and may cause product deterioration. At a minimum, several coats of a high quality sealer would be required to do this. Q. Are there any water issues? A. It is important to divert water run-off from the stone surface by using gutters, flashing & cant strips when necessary. Using the proper water diversions will help prevent surface damage. The use of caps can be used to provide adequate run-off protection. Corner or flat pieces should not be used on exterior horizontal planes or to cap walls. Q. Can manufactured stone be used as a flooring? A. The landscape pavers are best used for this. Our veneer stone is meant for wall applications. Q. Can manufactured stone stain? A. Yes, if it is not sealed properly it can stain just as natural stone can. It is not required to seal the stone, but if you choose to, use only a silane or siloxane based penetrating breathable sealer. Q. Are the stone colors on this webpage accurate? A. Although colors on this page are as close to the actual stone color as possible, variations can be expected. We suggest looking at a sample of stone before choosing your colors. Q. What is the installed price of manufactured stone? A. The installed price is approximately $18.00 – $22.00 per square foot based on the brand and style of stone chosen. Q. What about stone repetition? A. Manufactured stone is cast from thousands of molds and an average of 150 Sq Ft of original material can be expected with each stone profile. In addition, with colors hand-painted, no two stones are exactly the same.